“It’s my dream come true to be a part of this team.” These words were spoken by Yankees’ third baseman Miguel Andujar in a postgame interview following a game where he slugged arguably his most heralded hit of his young career, a go-ahead grand slam deep into the Rogers Centre stands, the first grand slam of his career. After this game, and a look at what he has accomplished in his rookie season, it is safe to say that Yankees’ fans dreams have also come true because Andujar is cementing himself as the Yankees long-term option at third base, after it appeared it was destined to be anyone but him. 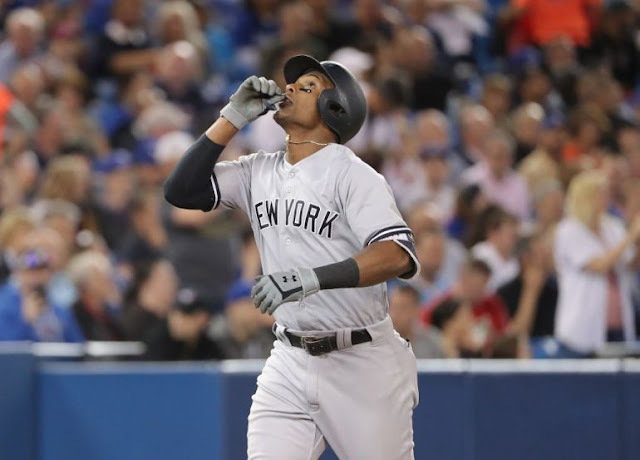 The cries for Andujar’s presence on the major league team originated far before the beginning of 2018. Chase Headley was on every Yankee fans’ last nerve in 2017 when he went hit .165 in the month of May with subpar defense to go along with it. His struggles were getting so bad that Gleyber Torres was rumored to be working out at third base to potentially get the call to the bigs, but saw his season lost in June after a freak incident involving a slide at home plate resulted in the conclusion of his 2017 season. However, Andujar was never seen as the guy to take the reins at third, despite posting solid minor league numbers. “Headley is our third baseman,” Cashman said in mid-June. Headley eventually heated up, and the Yankees acquired Todd Frazier in July to fix their corner infield conundrum. This left Andujar stuck in Triple-A for the remainder of the 2017 season, despite one of the best Yankee debuts in their rich history. On June 28th versus the White Sox, he went 3-for-4 with four RBI and a walk. Yankees fans were in utter shock when Andujar was consequentially “rewarded” with a demotion back to Scranton after his amazing performance. The reasoning was centered around his development as the Yankees believed he still had skills and tools to work on and polish. This is a fair statement, but a subtle lack of confidence shown by the Yankee front office. Andujar remained in Triple-A, until he made a few cameos, after being a September call-up. He was not a part of the 2017 playoff roster, but was set to take over the position in 2018, after the Yankees traded away Chase Headley and Starlin Castro in separate deals and let Todd Frazier walk in free agency to their crosstown rivals. 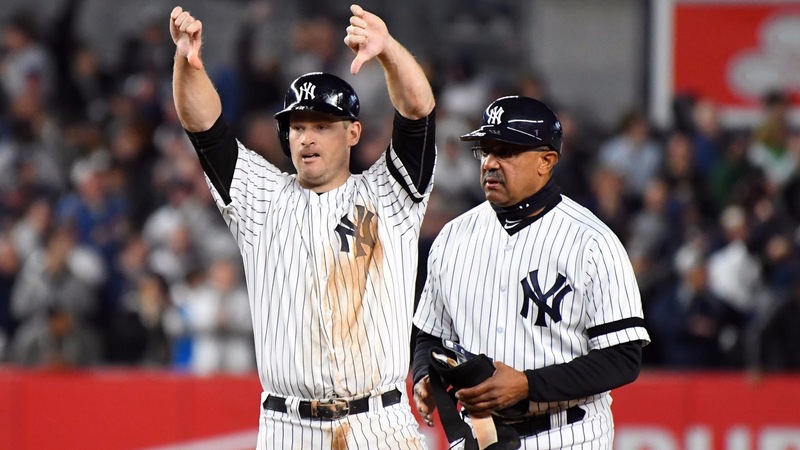 However, the Yankees weren’t sold on Andujar’s defense and tendency to swing at pitches outside the strike zone and acquired a pair of other options in Brandon Drury and Neil Walker to solidify the infield. A majority of fans were not completely sold either as Manny Machado trade speculation swirled on Twitter and social media all during the offseason and into spring training. Despite being the 59th best prospect according to Baseball America and logging a combined 56 XBH between three levels in 2017, Andujar was still not seen as the immediate answer for the short or long-term. Drury was named the opening day third baseman and Andujar was optioned to begin the year in the Yankee purgatory of Scranton/Wilkes-Barre. Fortunately for Andujar, the Yankees were bit by the injury bug and he got called up to the majors on March 31, before even playing a game in Triple-A. He got occasional playing time at third and shared DH duties, but Drury was still seen as the starter. That all changed on April 6th as he left in the sixth inning of a game against the Orioles due to migraines and blurry vision. The job, seemingly by the default, was now Andujar’s, and he has silenced all the critics. As of June 6, Andujar is slashing .305/.330/.542 and is third in the American Leaugue in doubles and ninth in XBH’s. His average exit velocity of 92.5 mph is within 0.5 mph of some of the game’s best hitters like Bryce Harper and Mike Trout. He’d be in the heat of the Rookie of the Year discussion, if it was not for the likes of Shohei Ohtani and his teammate Gleyber Torres also off to phenomenal inaugural MLB seasons. There was speculation Andujar could have been optioned back down to Triple-A, when Drury came off the disabled list, but the Yankees opted to keep Drury in Triple-A and allow Miggy to further cement himself as the starting third baseman. On top of that, Drury has not been bad in Triple-A either as he currently has a 27-game on base streak and has an .882 OPS. This vote of confidence has not been a mistake either as Andujar continues to improve on defense and has had big hits like his grand slam yesterday in Toronto. Andujar still has some flaws in his game. Defensive metrics still rate him as one of the worst at his position and his walk-rate is extremely low, but he is still a young kid and the way he handles himself and the bat has finally caught the eyes of fans and executives alike. During his journey to the majors, there was always someone better, another player that could field better, throw better, hit better, and handle the spotlight of the Bronx better. However, Andujar has silenced anyone who did not believe he had what it took to be a successful everyday player. At this point, the only major question concerning Miggy is what took the Yankees so long to give him this opportunity?